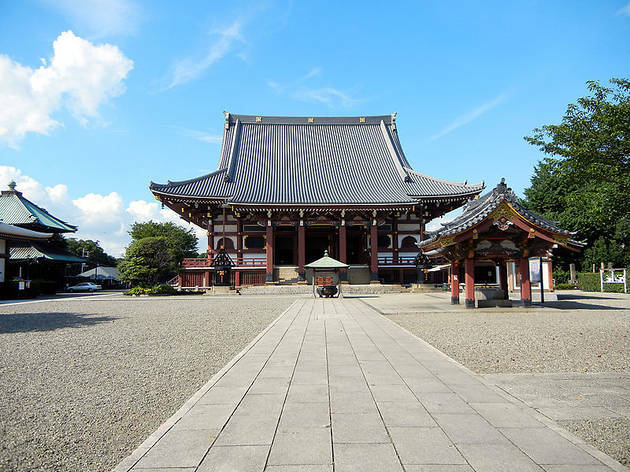 Standing on a lush hill and rising high above the buildings around Ikegami Station, this imposing temple is built on the site where Nichiren, founder of the Buddhist sect of the same name, is said to have died in 1282. Climb the stone stairs from the south, and you’ll arrive at the entrance of the enormous and beautiful main building, reconstructed in the 1960s. Also, don’t forget to check out the five-storey pagoda, a survivor of the World War II bombings and the oldest of its kind in the Kanto region, as well as the rough but powerful Nichiren statue. The best part is that there are usually no crowds here, even on weekends. A festival is held here in October every year (on the anniversary of Nichiren's death), featuring parades, floats and music.